I adopted two full grown 16 pound male cats from California recently. Yes, you read that right...16 pounds! Keeping the litter box fresh and odors eliminated can be a challenge. You can have pets without your home eventually smelling like your beloved animals! The other challenge is saving money on litter products without sacrificing quality. 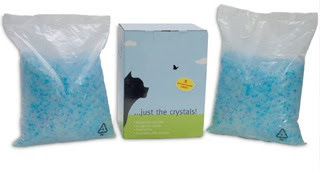 Crystal cat litter is a products that I've never experienced until now. I'll admit that it's too expensive for my budget, not to mention I'm a skeptic. I want a product that is safe for my cats, humans and the environment. When visiting various online litter companies, I came across Just The Crystals and enjoyed what I read so I dropped them a line and here we are! Double bonus! Safe for cats and recycled materials are used! Commercially available crystal cat litters have been extensively tested and are safe for your cat. Its basic chemical makeup can be closely compared to sand. The industrial name for it is silica gel, which is non-crystalline, porous and a safe substance most commonly used to absorb excess moisture in flowers and food or to protect materials such as leather or computer equipment from humidity. Fragrance free, conveniently packaged* -- and all packaging is fully recyclable! *2 pre-measured, recyclable bags, each weighing 4.4lbs, for a total of 8.8lbs of premium crystals. All packaging is fully recyclable -- and our boxes are made from recycled cardboard! What about the price? You can purchase Just The Crystals through Amazon with FREE shipping for $15.95 for two pre-measured bags which can last up to 30 days when used properly and kept in a dry place away from moisture. Grocery and Department stores can be insanely high when it comes to purchasing crystals! I'm sold, it's worth a shot to save money and use a quality product. While I do have the product in my home right now, I haven't used it long enough to really experience the product fully. I cannot give an accurate opinion on it as of yet. However, I am pleased so far with the results and used a tip shared on Just The Crystals about sprinkling a light layer of baking soda in the bottom of the litter box to help prevent odors. Silica gel litter, often referred to as "crystal litter", is a porous granular form of sodium silicate and has the highest absorbency of any litter. It has excellent moisture control and complete odor elimination for an extended period of time compared to other litters. Some praise its absorbency because 4 to 5 lb (2+ kg) can absorb liquid and odor for up to 30 days for one healthy normal weight cat. It is important to lightly stir the crystals daily while scooping the solid waste, otherwise urine can pool in the box. When crystal litter is saturated, at the end of 30 days or so, it begins to smell and is visibly saturated. In comparison, over the same time period it may take 20–30 lb (9–14 kg) or more of clay or clumping litter, because it is necessary to replenish the litter that is removed when the clumped urine is scooped out. No replenishing is necessary with silica gel (crystal) litter. Others have claimed that this litter gives them no warning when it is saturated and their cat left a urine puddle at the bottom of the pan. But as mentioned above, this litter will eventually begin to smell when the crystals can no longer hold any more urine. Also, as the crystals absorb the urine odorlessly, they turn from white (or blue) to slightly yellow. This is when a crystal is 'visibly saturated'. It is easy to determine when this litter needs changing because you can either smell urine (the crystals are over saturated) or you can no longer see any white (or blue) crystals. Crystal litter is extremely lightweight, especially when compared to heavier clay and clumping litter. How about a giveaway?! Just The Crystals has generously offered to sponsor a giveaway! TWO winners will each win 2 boxes of Just The Crystals cat litter! That is 4 pre-measured bags of litter crystals per winner! MANDATORY ENTRY: Visit Just The Crystals and tell me something else you learned that I didn't post here. *What litter do you normally use? *What do you prefer...Clay, Clump or Crystals? I received a sample of crystal cat litter from Just The Crystals to share the product with my readers. However, I have posted my own unbiased opinions on these product. All opinions are strictly my own and true. I love the crystals from Fresh Step and mix them with clumping fresh step. Unused cat litter is safe for handling by pregnant women. However, pregnant women should avoid handling used cat litter. Toxoplasmosis, an illness characterized by cold or flu-like symptoms, can be transmitted by cat feces. It is especially serious in pregnant women because it can cause birth defects. Immunosuppressed persons may also be susceptible to toxoplasmosis. For further information, consult your doctor. Don't really use just one kind but rather buy whatever is on sale. Just bought Tidy Cat but last time it was Scoop Away. Switched from clay to clumping about 3 years ago. With 7 indoor kitties it probably ends up costing about the same or less than the clay did. This Litter is Fragrance free which is a Good thing as Kats have stong noses and do not like things that smell to strong! Pregnant women should not handle used cat litter. Thanks for the great giveaway. I use Fresh Step right now. I learned pregnant woman should not clean used boxes. I have been using farm and fleet brand litter. Remember -- moisture is the enemy of your crystal cat litter. Placement of your litter box in a dry, well ventilated area will pay huge dividends in getting the most out of it. You stir it to extend the life of the litter. It then releases water, not urine, water vapor. I learned on their web site that unused cat litter is safe for handling by pregnant women. We normally use Tidy Cat in our home. We currently use clump litter, and that's okay, but I wonder if I wouldn't like the crystals better, as I haven't tried them yet. I learned that it is easy to determine when this litter needs changing because you can either smell urine (the crystals are over saturated) or you can no longer see any white (or blue) crystals. I learned a Tip on making the litter last longer: good air circulation. Silica gel absorbs liquid fairly quickly, and releases it as water vapor fairly slowly. Crystals and forever litter trays! I learned...Fragrance free, conveniently packaged* -- and all packaging is fully recyclable! I learned that sprinkling baking soda in the litterbox before putting the crystal litter in can help further eliminate odors. With four cats, this is a tip we can use! We normally use Arm & Hammer Multi-Cat, but I'm open to anything effective and environmentally friendly! I follow on GFC as ohkeeka. I did learn that if you can place the litter box where there's a breeze, the litter will last a lot longer. Or, you can try what I've recently done: put a small fan above the box, so that it constantly blows air down onto the litter. I follow you on twitter(id electricisland) & I tweeted. I learned that the litter needs to be stirred every few days. I'd do that every time I cleaned it. I usually use Cat's pride downstairds and Swheatscoop upstairs (I have 9 cats). I prefer crystals but they are pricey. I learned its basic chemical makeup can be closely compared to sand. The industrial name for it is silica gel, which is non-crystalline, porous and a safe substance most commonly used to absorb excess moisture in flowers and food or to protect materials such as leather or computer equipment from humidity. I've seen small packets of this in some of the things I buy where moisture could damage the product. I'm currently using another brand of crystals and it works very well. They emphasize that moisture is the enemy of your crystal cat litter. Placement of your litter box in a dry, well ventilated area will pay huge dividends in getting the most out of it. I generally use whatever is on sale or that I have a coupon for. I prefer clumping, but like it when there are crystals in the mix as well. I learned that the product is fragrance free, which is great for my picky cat. I learned that because of the risk of getting toxoplasmosis pregnant women should not handle the duties of changing kitty litter. I normally use Fresh Step. I prefer to use crystals. I learned that Just Crystals was originally developed primarily for use with automatic litter boxes. We currently use Fresh Step cat litter. We prefer Crystal cat litter. I learned that these were originally developed for use in automatic litter boxes. We usually use Johnny Cat. I learned that The litter still needs to be stirred every few days, especially towards the end of its useful life. I love that the litter is fragrance free! Thanks for hosting a great contest! This stuff was originally used in automatic cat litter boxes and used to absorb moisture from electronics and other things that could be damaged in transport from excess moisture. I usually use cheap clay litter for $3 a bag and maybe some dirt to help absorb. I prefer something that really does absorb the odor when you have to share the bathroom with more than one cat! I learned that you have to mix it every few days. I learned that this litter is safe for pregnant women if the litter hasn't yet been used. I am a clump kind of gal! I use whatever is on sale! I found out it was originally developed for automatic litter boxes but can be used in any litter boxes. We have been using Arm & Hammer for multiple cats. We prefer the clumping litter. I learned that Placement of your litter box in a dry, well ventilated area will pay huge dividends in getting the most out of it. I thought it was interesting to learn that the bags and boxes are eco friendly! I think that is very important! Right now, I'm pretty sure I use fresh steps! The JTC is the number 1 selling crystal litter on Amazon!